You are obviously aware about trampolines and the addicting fun they provide. But do you know that the same jumping fun and the adrenaline rush can also be experienced out on the water. Well a common rage now days are Water Trampolines. But the question that many ask is whether they are safe or not. Manufacturers specify the amount of jumpers allowed on each water trampoline so as long as you follow their guidelines you should be just fine. To add to the safety precautions it is advised to set up the trampoline in deeper water and rock free areas. Many say that the water trampolines are a novelty and not for everyone. But that is not the case as you can get some of the best water trampolines like Rave Sports O-Zone Water Bouncer and Banzai Bounce Trampoline on Water and Land. Below you will find our list of the top 8 water trampolines. 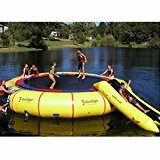 Island Hopper 17ft diameter Water Bouncer is one of the best water trampoline out there and may be the best pick for you and your family if its in your beudget. Though a little expensive it comes with some great features and a high safety rating. Warranty – The trampoline comes with a 5 year warranty and even after that the maintenance cost is low compared to others. Heavy Duty Material – The material used in manufacturing is 1000 – denier polymer that can last and stretch and is very flexible. Padding – It is equipped with a 0.5 inch padding of foam that could not be found in other brands. The nylon Webbing mat provides a little extra bounce to the user. Swimming platform is spring less and naturally bouncy. The trampoline does not come with any accessories and you have to buy them from vendors. Rave Sports Bongo Water Bouncer is a little expensive but worth the investment. It is sturdy and has a bouncy mat. and comes with a lifetime warranty period. The trampoline is the top choice of the customers and has got some of the best reviews. Lifetime Warranty – The manufacturer provides a lifelong warranty for defects. Sturdy and Durable – Made with 1000 – denier polymer the trampoline is sturdy and lasts longer. Boarding ladder is provided as an accessory with the trampoline. The boarding ladder comes with boarding assist handles. Rave O – Zone Plus Water Bouncer comes in two colors and is specifically made for children ages 5 – 12 yrs. The 7ft bounce platform is big enough for two children at a time and the product comes with joint accessory. If you are looking to buy a water bouncer for kids, than this is the best pick for you. Bounce Platform with Slide – The 5ft long bouncing mat comes with an additional slide to add to the fun. Vinyl Handles – The handles made with vinyl are perfectly soft and safe and minimize the risk of injury. Grab Lines – Around the whole perimeter at some distance grab lines are fixed to ease the getting on and off process. The water trampoline comes with additional accessories like slides and climbing ladder. Every part is UV treated and special PVC constructed. Aqua Jump Eclipse 120 is another great water trampoline from Rave which can accommodate both adults and children. The trampoline is easy to set up and quick to inflate. If you want quick and easy fun then this trampoline is for you. Included Ladder – A 3 step ladder comes with this trampoline as an added bonus. Anchor Connector – An anchor connector kit is also provided to secure the trampoline in a particular space. Adult and Children Friendly – The trampoline is specifically manufactured to accommodate both adults and children. The construction is commercial grade and all the parts are UV treated. Comes with a high-speed inflator and deflator. Slightly more expensive than it is worth. 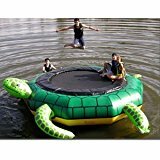 Island Hopper Turtle Hop Water Bouncer 13 ft is a good trampoline for the price budget. It takes few minutes to set up and inflate and provides extra bounce than the others in this series. At the price that it comes for this is a good value. Portable and Quick Setup – The trampoline is easy to transport around and can be set up in a matter of minutes. Accessories Included – The trampoline comes with added accessories like repair kit, transport bag and hand pump. Sturdy Material – The material used is durable and sturdy and the seams are heat welded with 30 gauge PVC. The 9ft diameter jumping area. 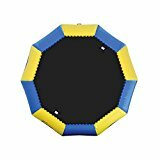 The trampoline gives more and better features at low prices. The warranty period is not great. Island Hopper Giant Jump Water Trampoline has similar features to its above ground counterparts. It comes with extra springs and a large mat to provide a giant bounce which increases the fun. If you are looking for a rush of adrenaline and a crazy fun time then this one is definitely a pick for you. Commercial Purpose – The trampoline can accommodate 4 – 6 adults at one time and is made at commercial grade. Accessories – The tie D rings and anchor are provided with an extended warranty and a repair kit is also given. Side Handles and Ladder – The bouncer is equipped with 2 side ladders and side handles for easy swimming and climbing purposes. The water trampoline is for commercial uses and centre mat is spring fixed to provide extra bounce. The inflation tube is 3 chambered to increase safety and durability. The price of this commercial trampoline is very expensive. 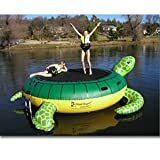 Island Hopper 15ft Turtle Jump Water Trampoline comes with almost same features as the turtle jumper but with a larger mat so it can accommodate more people. This is a full family water bouncer which comes with added accessories. UV Treated Construction – All materials used are UV treated and it is made of 1000 denier. Assist Handles and Ladder – It is equipped with a ladder and side handles to help the swimmers get easy access to it. Sturdy and Stable – The multi inflated tube adds to its strength and makes it more stable on the water. The spring Mat is an added bonus and gives a giant jump. It is equipped with a 4 step ladder and assisting ladder handles. Banzai Bounce Inflatable Trampoline is a mini water trampoline that can be bought on a really low budget. The jumping mat is strong and made of polypropylene. It is basically only for one jumper at a time and is a good buy for those with a low budget. Strong and Durable Material – Made of Polypropylene and PVC enforced it is strong and durable. Multipurpose – The trampoline can be set up on both Ground and Water and is safe for both uses. Accessories Provided – Comes with sandbag anchor and rope ladder for climbing. Cheap for those on a budget. An additional repair pouch is also provided and comes with a year warranty period. Although low priced, it is less safe and the bounce is really small. Hard for kids to climb on top. 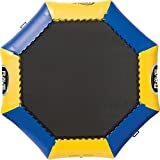 If you still want a traditional trampoline get more information from this link https://trampolinereviewsite.com and for mini trampolines see this link https://trampolinereviewsite.com/best-mini-kids-trampolines.